The Internet's fourth album, their most focused if not their most compelling, is a distillation of everything that makes them so distinctively cool. In a perfect world, Hive Mind would be that ubiquitous summer album you'd hear all over the place. It's got a little bit of everything: easy-going beats, optimistic lyrics, and a couple of tracks designed for mindless fun. It probably won't quite end up that way, because the world still hasn't figured out what to do with the band that made it, the Internet. But perhaps this album will change things. Tyler, the Creator; Earl Sweatshirt, and Frank Ocean are the most famous artists to emerge from the circa-2007 assemblage of left-field musicians and rappers known as Odd Future (the post-millennial version of the late '90s Soulquarians cypher featuring the Roots, Common, and others), but that's also where the Internet began. Syd tha Kid was one of the collective's DJs and teamed up with keyboardist Matt Martians and drummer Christopher Smith for the first Internet album, Purple Naked Ladies (2011). Almost immediately, the band showed signs of evolving away from Odd Future's enfant-terrible persona into a more expansive sound. By the time of the third album, Ego Death (2015), the core had expanded to include wunderkind guitarist Steve Lacy and bassist Patrick Paige II. Each of their first albums received nice write-ups, but somehow flew under the black pop radar. While the band itself might have been black pop's best-kept secret, its members weren't. In the time since Ego Death, Syd released a gorgeous, intimate solo album (Fin), Lacy wowed folks with his five-track Steve Lacy's Demo and production work on Kendrick Lamar's DAMN., and Martians gave us his solo debut, The Drum Chord Theory. 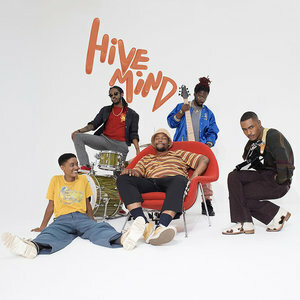 Now comes Hive Mind, easily their most mature and focused work to date, if not their most compelling (that's still Ego Death), and a distillation of everything that makes this band so distinctively cool. The opening riff of "Come Together" sets the tone: Lacy's hooky rhythm guitar and Paige's bass evoke a '70s funk groove, with Syd's breathy vocals on top. You can read whatever specifics you like into the meaning of the central lyric "they gon' get us to come together", but it certainly feels like a song for right about now, whoever your "they" might be. That's followed up by a rarity for current black pop - "Roll (Burbank Funk)", a funk groove updating the roller-skating jams of days gone by, delivering nothing but the invitation to a good time. "La Di Da" extends another invitation to the dance floor, even if it's not as upfront about it as your average club-banger. The laidback funk continues throughout the rest of Hive Mind, from Syd's seductive "Come Over", "Stay the Night", and "Bravo", to the keep-ya-head-up "It Gets Better (With Time)" (featuring Paige rapping down the coda). Lacy's guitar is a joy, throwing out sticky hooks one after the next like the second coming of Shuggie Otis. If anything, Hive Mind is too laidback for its own good. There's no denying the band's musical chops and production smarts. They're a band of black pop savants, evoking classic funk while adding contemporary touches all along the way. But while they're clearly planting a flag in the ground for old-school funk, they don't quite get all the way down into it. Hive Mind floats more than it percolates, closer to ethereal Maxwell than four-on-the-floor P-Funk. The playing is stellar, but the production's overall subtlety undercuts its impact. There's nothing really upfront or commanding about it, as it settles into a mid-tempo pace and pretty much stays there, except for "Beat Goes On". The closing track, "Hold On", indeed feels like one of those end-of-the-album slow jams from back in the day. It's a standout piece on its own, but because so much of the previous music doesn't rise above smooth and mellow, it blends into the vibe without being the summation to a great album that it aims to be. The album could have used some more uptempo funk to it, especially if the band was trying to be funky in the first place (perhaps the urgency factor will kick in when these tunes get performed live). That said, Hive Mind ought to appeal to a whole different crowd beside the alt-black pop community, including longtime lovers of old-school R&B, who never would have been bothered with anything named Odd Future. Black bands playing live instruments have been a rarity in mainstream black pop ever since the Roots; so folks who miss that sound will be happy to know the Internet's out here and will probably enjoy Hive Mind. It's not much more than easy-listening funk, but it's freshly played, and the band sounds great together. Let's hope they kick it up a notch next time around.